The 1st Annual International Streethunters.net Meeting in London! Home Announcements Announcing the 1st Annual International Streethunters.net Meeting in London! 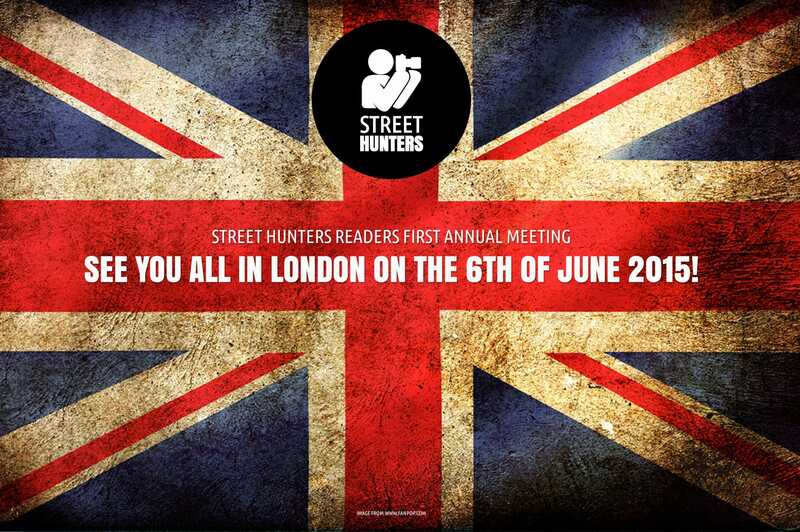 Announcing the 1st Annual International Streethunters.net Meeting in London! It is with great pleasure that we announce that on the 6th of June 2015 we will be having our 1st Annual International Streethunters.net Readers Meeting in London! That means that we will meet in the UK capital for a whole day of Street Photography fun! Anybody can come! If you want, bring your friends too! The plan is simple. We will grab our cameras and shoot in the streets of one of the most interesting cities of the world and at the end of the day we will talk about the experience. We will all participate in a London Street Hunt video that will be published on the official Streethunters.net YouTube channel! The Street Hunt locations will be picked out by our local, London SHRC Moderator, Anton Fortein who will plan most of our day. We will split into small groups and do missions! Then we will meet after a couple of hours and evaluate our work. So, for example we might all go on a mission to photograph people in motion blur, or we might have a mission to capture people looking at us through bus or train windows. At the end of the day we will try out some Flash Street Photography and see how that turns out! I have shot with a flash before and I find it a very fun experience. Finally we will all go to a pub and enjoy our beverage of choice and have a few laughs! It will be a pleasure to meet you all and share a whole day with you on the Streets of London! Saturday the 6th is the formal date, but we plan to extend our activities to the 7th if you are willing to cover some more miles and take some more photos! What a great day(s) you will have. It makes me want to jump on the next plane…..
My wife and I are visiting London beginning 5 Sept. Hopefully, you will have an event that week that I will have the opportunity to participate in. It would be fantastic when you post pictures of your upcoming event if you could ask your participants to state where the images were captured. However I do wish you the best of times. According to my fellow Brit Street Hunter Digby Fullam, September is rather nice in London. The weather usually is good, so you should be looking forward to shooting some nice shots. Yes we are going to have a blast Andy!!! Sounds like a good time and you’re even holding it on my birthday. Haha, it would be fun to meet up. Unfortunately, I’ll be too busy unpacking my stuff in Instanbul to make it, but you all have a great time! Hello Jackson and thanks for stopping by. We will be posting more info about meeting time and meeting point in the next couple of weeks.